Welcome to my website - I'm happy you took a few moments to stop by. Have a cookie! Here you'll find information about my books, a live interview on YouTube, and the latest news on upcoming releases. But first, let's celebrate TEA PARTY TUESDAY! Welcome to our afternoon tea! 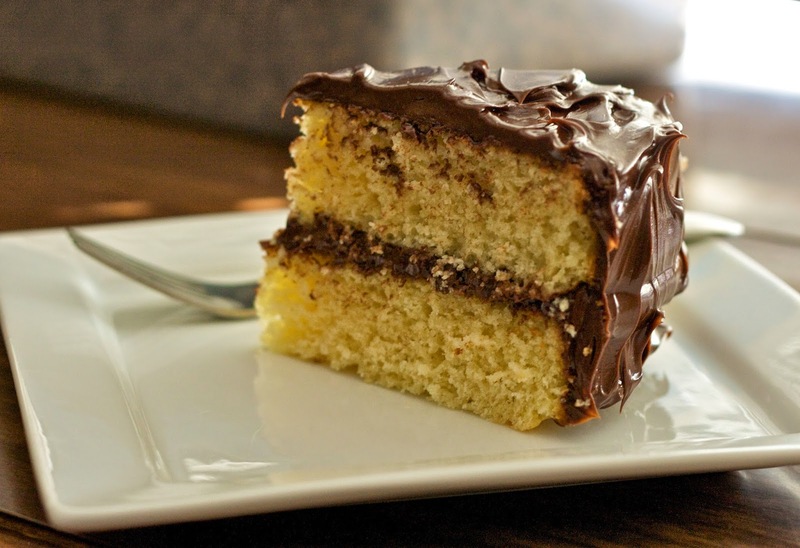 I just made the most lovely butter cake with chocolate frosting and want to share it with you. Let me pour you a nice cup of tea - milk? Sugars? How has your week gone so far? Mine has been an exciting one publishing Book 8 "The Long Trip Home." I hope you'll enjoy the story. It's available on Amazon, Nook, Kobo, and Smashwords. I don't know about you, but having a good book to read along with a nice cup of tea is as good as it gets - unless it's sharing a cup with you! What's "The Long Trip Home" about, you ask? 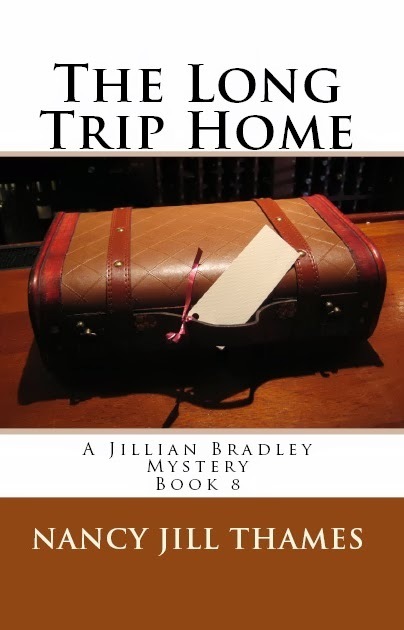 Here's the synopsis: As Jillian Bradley prepares to embark on her honeymoon, a terrible tragedy strikes. Now she must help exonerate Richard Zhou of murder. But when Jillian's health fails, a dear friend back home is called upon to help and joins Jillian to solve the case. Even with Teddy at her side, will Jillian have the strength to find the real killer? "The Long Trip Home" is an ordeal no one should have to face. Thanks so much for joining me today. 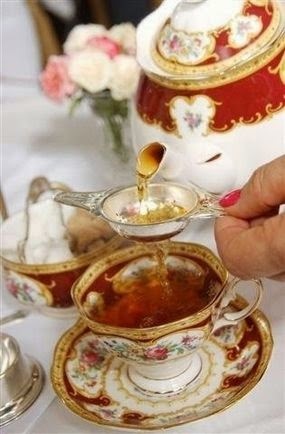 I hope you'll spread the word and invite others to our Tea Party Tuesdays. When I was in junior high school, I wanted to become an architect or a yacht designer. After high school, my best friend and I dreamed of opening a studio where she could teach dance and I would teach piano. The closest I got was getting a degree in music, teaching piano lessons at home for one year and serving as the church choir director for four years. My husband took me on business trips to great resorts, my friends and I had tea parties, and life was generally good until one day, I got bored. Since I loved to read murder mysteries, why not write one? The quest was short lived since our youngest still needed my attention, until nine years later when I took advantage of my tech-savy son and plunged into the world of blogging. 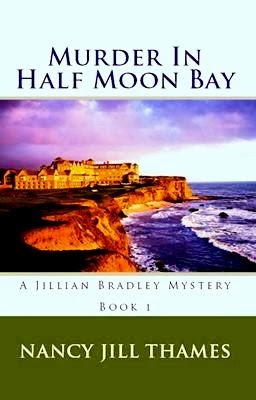 I salvaged the book I had started called "Murder in Half Moon Bay" and published the first Jillian Bradley mystery in 2010. Then I started writing Book 2 "The Ghost Orchid Murder." 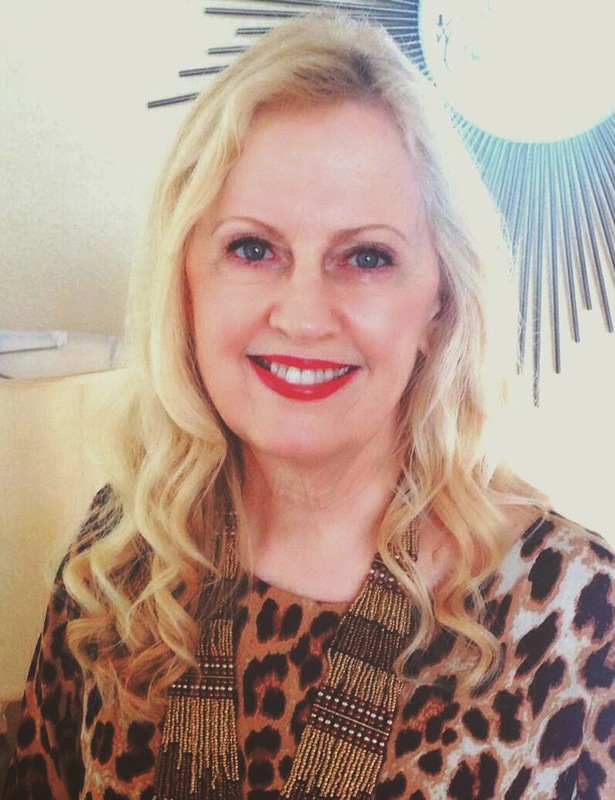 They used to say, "Life begins at forty," but for me, a new life as an author began in my sixties. I hope you enjoy Jillian Bradley's adventures with her little companion, Teddy. The stories are based on the wonderful life God has given me filled with travel, good times with family and friends, and our little Maltese, Chloe. 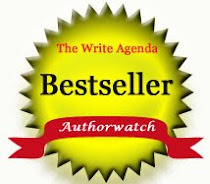 I am a member of Leander Writers’ Guild, American Christian Fiction Writers (ACFW CenTex Chapter), and Central Texas Authors. Thanks for the visit - now explore if you like, and don't forget to finish your tea. Oh, I almost forgot. In the bottom right-hand corner you might like to hear the radio interview on Blog Talk Radio featuring a few of my COZY MYSTERY MAGAZINE friends and me. Thanks for checking it out! Caring is sharing - please share anything you like using the buttons in the footer. Thank you! Welcome to our tea party! I'm delighted you could join us. Let me pour you a cup of tea. Milk? Sugars? Please help yourself to sandwiches. 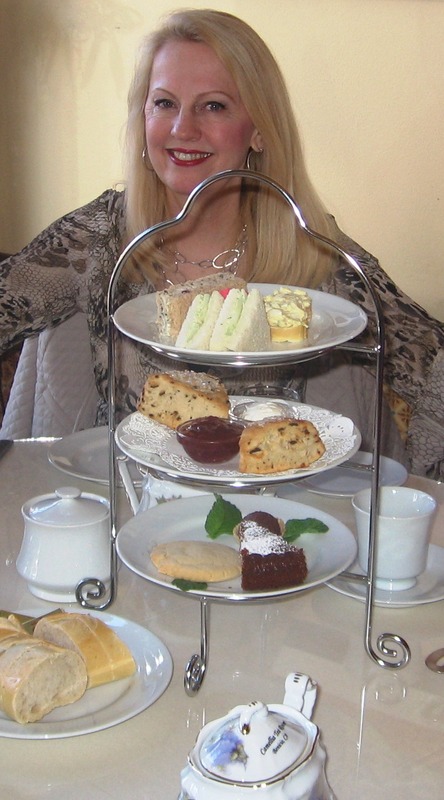 Since my protagonist, Jillian Bradley, enjoys afternoon tea as often as possible, I thought I'd share how and where it all began. According to Twinings, afternoon tea, a quintessentially English tradition, is rumoured to date all the way back to 1662 when Catherine of Braganza, King Charles II of England's Portuguese wife, introduced tea to the royal court. 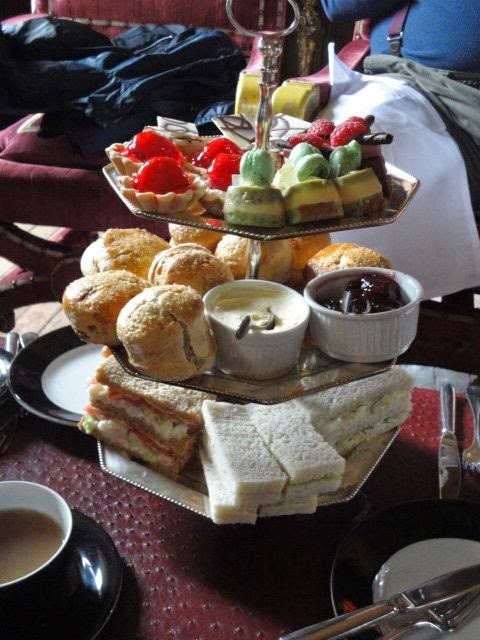 But the afternoon tea menu, as we have come to know and love it, took quite a while to develop. By the late 1830s - early 1840s afternoon tea was evolving to become a social occasion and it's even hinted at in an unfinished Jane Austen novel from 1804,The Watsons. Around this time, it was usual to have a long gap between the relatively light 'luncheon' served around midday, and dinner served around 8pm. The Duchess of Bedford was a close friend of Queen Victoria and a prominent figure within London society at the time. She requested that light sandwiches, tea and cake be brought to her in the late afternoon because she had a 'sinking feeling' due to the long gap between meals. Other social hostesses quickly picked up on the idea and the practice became respectable enough to move it into the drawing room. 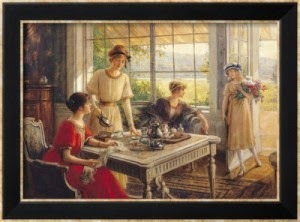 This pause for tea became a fashionable social event. During the 1880s upper-class and society women would change into long gowns, gloves and hats for their afternoon tea which was usually served in the drawing room between four and five o'clock. Nowadays, we may only dress up for tea on special occasion, but I've been to tea shops that provide hats, just in case you want to! 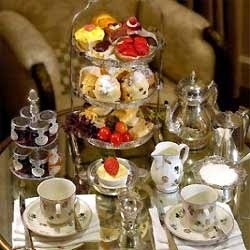 And look at us now - we enjoy afternoon tea together on Tea Party Tuesday at Queen of Afternoon Tea! 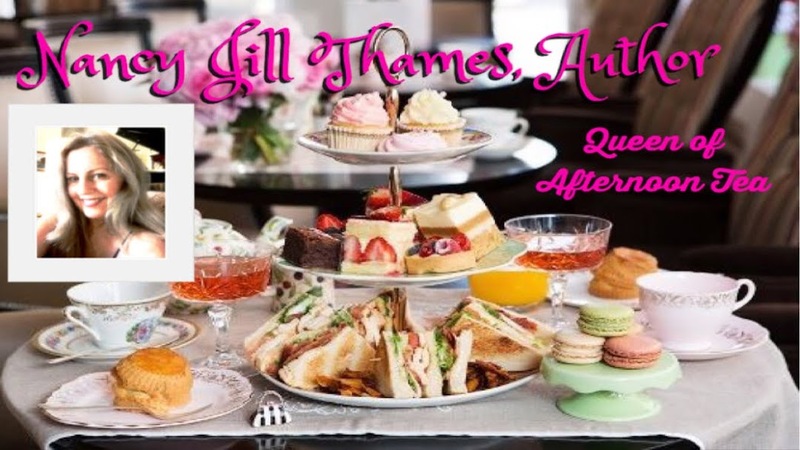 I hope you'll get my free copy of "Murder in Half Moon Bay" (if you haven't already downloaded it) and begin the series filled with afternoon tea and adventure. Welcome to our tea party today. Let me pour you a nice hot cup of Darjeeling and we'll get started. Milk? Sugars? Do help yourself to the food - we have Scottish fare today, rather appropriate since my husband and I've been watching the "Monarch of the Glen" series on Netflix (for the second time). I wanted to share a new cookbook that launched last week called "Cozy Food" edited by cozy mystery author and friend, Nancy Lynn Jarvis. 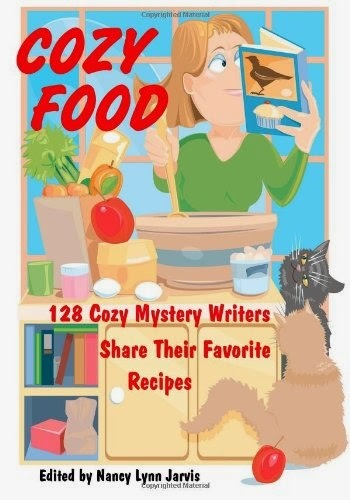 I think you'll enjoy this unusual collection of recipes by 128 cozy mystery authors. Look for my Raisin Scones and Mock Devonshire Cream recipes inside. As I read each name I noted three in particular. The first was Camille Minichino, aka Margaret Grace, author of the Miniature Mystery series. In 2001, Camille signed one of her books for me wishing me well in my writing at the first literary conference I had ever attended. What an inspiration she was! Please help yourself to a scone - they look absolutely delicious! 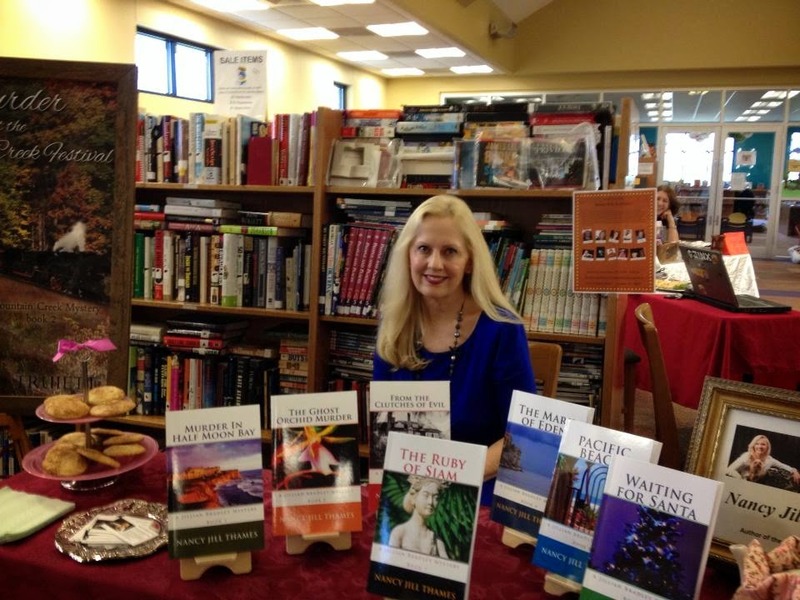 Sandra Balzo was another author who responded to a question I had. She was so gracious and kind and encouraged me to hang in there! She writes the Maggy Thorsen Mystery series and Main Street Murders. Let me refill your cup. 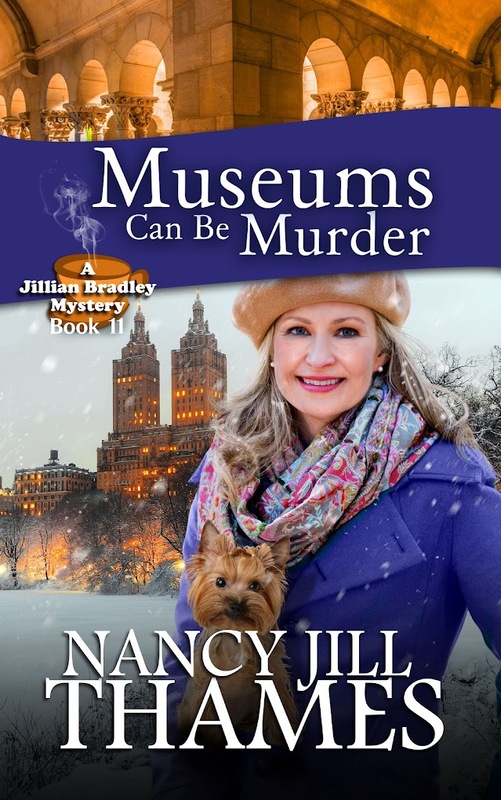 Finally, Traci Tyne Hilton, a fellow collaborator on our Cozy Mystery Magazine blog has contributed a recipe to Cozy Food. Traci writes cozy Christian fiction like I do and is a prolific author of the Plain Jane and Mitzy Newhaus Mystery series. 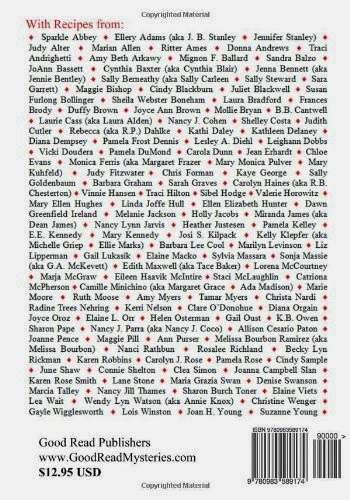 You may want to explore the back cover as a resource for finding new authors. I hope you'll get a copy and spread the word on the share buttons below! Thank you for spending time with me today. I enjoyed the company. Welcome to our tea - let me pour you a nice hot cup and we'll have a nice chat. Today, I've made shortbread from a recipe I've had for ages. A dear friend by the name of Sherry Niemi gave it to me years ago when we used to meet for a weekly craft time and luncheon. There were four of us, perhaps the first garden club of sorts. The garden club began as an old fashioned sewing circle reminiscent of the one my husband's grandmother belonged to. Ladies would get together, sew, chat, and have lunch. Oh, what a fun time they had. I thought my friends and I could do the same, and so we did. After I moved from Sacramento to the Bay Area of California, I continued the tradition with new friends. Whenever I bake the shortbread, though, I fondly remember our first group. Let me refill your cup, and do have another cookie. I don't know about you, but whenever I visit my grandchildren I love to bake. When my husband came with me on this last trip and saw all the baking I did, he asked why I didn't bake at home. I merely stated the obvious - we don't need the extra calories! Then I felt sorry for him so that's why I baked the shortbread today. The recipe is simple - I hope you'll try it sometime. 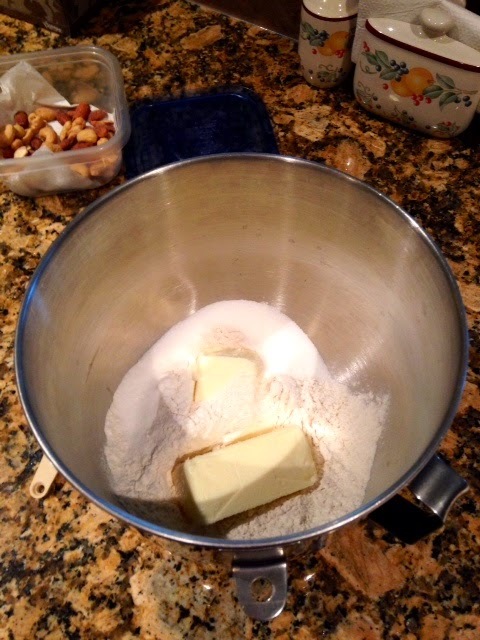 Mix sugar and flour together, add butter and cut in with fingers or mixer. Press into cookie mold (or roll out on floured board and use a cookie cutter). Place on ungreased cookie sheet (I like to use parchment paper), and bake at 350 degrees for 20 minutes. When you read the Jillian Bradley mysteries, I hope you'll experience the fun our garden clubs had every time we met. What about you? Do you get together with a group of friends on a regular basis? Welcome to our tea today. Let me pour you a cup. Milk? Sugar? Mothers Day is this coming weekend - I hope you all have a lovely day with your children celebrating you! As you can see from the photo, I'm thinking about two characters in my books. 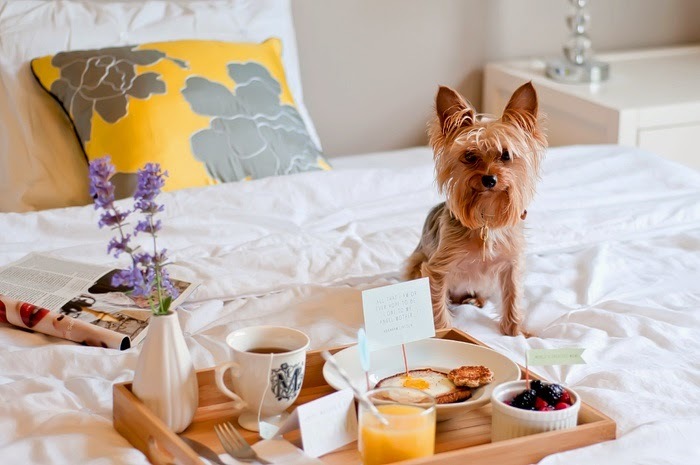 Jillian Bradley is a childless widow with only a tiny Yorkie for a companion. What would she be doing on Mothers Day, I wonder. With four children of my own, I've never really thought about how women who have no children might feel on this particular day. Perhaps they focus on their own mothers, or celebrate the event with those who have kids. I think if I were someone like Jillian, I would not only honor my mom, but would probably have a dog, or maybe more than one to shower with affection. This week I read a post on Facebook that touched my heart. It said that a dog is part of it's owner's life, but an owner is a dog's entire life. Please have a finger-sandwich or two. How do you plan to celebrate this weekend? I think for dessert I'll try this lovely strawberry tart. Please take whatever you like. Whether you are a mom or simply have one, I hope your Mothers Day turns out special. And if your mom has passed, I hope you'll remember the good things about her life. Until we meet again, cheers!